Posted on November 4, 2013 by Dante DeAmicis	in and Performance Art, Essays and tagged Cobb Mountain, Lake County attractions, Lake County guru, Lake County hiking trails, Lake County mountains, Whispering Pines. Cobb Mountain is the tallest mountain in Lake County this side of the Northern wilderness area. Konocti gets all the press and photos but its a lowland compared to the mighty Cobb at about 4700 feet. 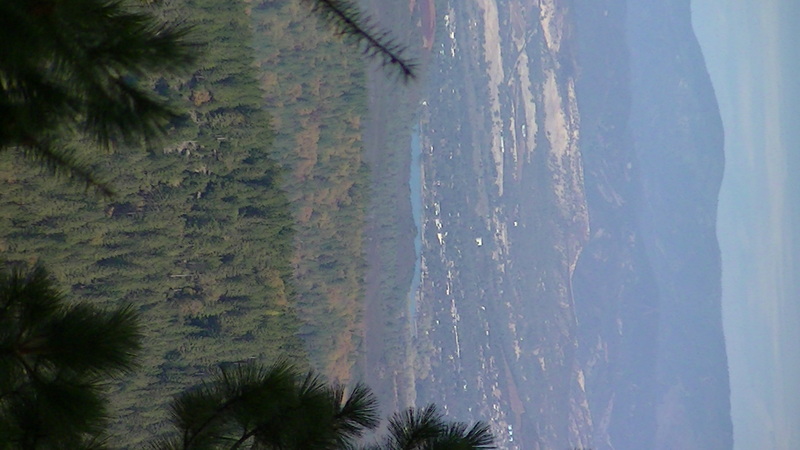 I’ve worked on the ridge below the peak where the view of Sonoma and Lake Counties is awesome. I decided I would find a way to reach this flattened high point of Lower Gooberstan. There are no public roads or right of ways going up to Cobb even though there are antennas and a chunk of state owned land at the top. The internet revealed the location of the old right-of-way formerly used to service the antennas. ATT and Mediacom now go through gated Calpine roads which are very well maintained. The internet site revealed the old road has been abandoned to fallen trees, erosion, rockfalls, and is overgrown in places. In the best of times the road was cardiac steep for hikers. But the owners were used to the road being used by outsiders and don’t seem to be reasserting their property rights at this late date, in spite of the gate and scary signs. We’re told its two and a half miles to the summit. I decided I would discover the mysteries of Cobb after my October 28th grave shift on Bottle Rock. So off I went walking to Whispering Pines, following the sparse directions from internet bloggers. Through the gate at the end of Pinewood I went until I reached the still used dirt road that went left and the broken has-been of a road went up and right. My first decision. Yes, that had to be the one true way – upward and onward. Soon the old road passes between a row of large boulders. Sometime in the past someone created this passage through these silent sentries. The road winds around the face of the great old one which is sporting an edgy new growth of pine stubble in the former clean shaven road, another symptom of unemployment. One positive effect of neglect and harshness is I haven’t seen a single piece of trash. Whiners on the web site complained of fallen trees but someone has been cutting away limbs and notching through the big trees. The trail disappears but I decide since it was originally a fire trail I would continue in the same direction. Sure enough, the road reappears as if by divine intervention. Finally I come to the first switch back around a monolithic boulder. Another half mile and the now trail widens out to a crater filled with broken rock. A tall dead tree over hangs. New tenants have moved in. The trail gets steeper and the feeling of hiking up the side of a canyon is gone. The rocks have all morphed from spotted gray to dusty white. Even though the trail is clear it is clearly a trail. All traces of this being a former road have vanished. In addition to the rounding of erosion and the absence of tire tracks there are thousands of seedlings and Christmas Tree size trees probing and prodding from both sides. The trail seems to be consenting. It is as if nature decided to landscape the trail for hikers and serious bikers at the expense of the unused road space. There is little indication of much more mountain to climb. A large tree that has fallen across the path has been cut through with a chain saw. Laying on one side of the log passage is a woman’s lacy top. I notice it is size XXL. A woman from a “Robert Crumb” comix has passed this way. This ain’t no ordinary nature trail. Sure enough, another half mile later I reach a junction on the top ridge. 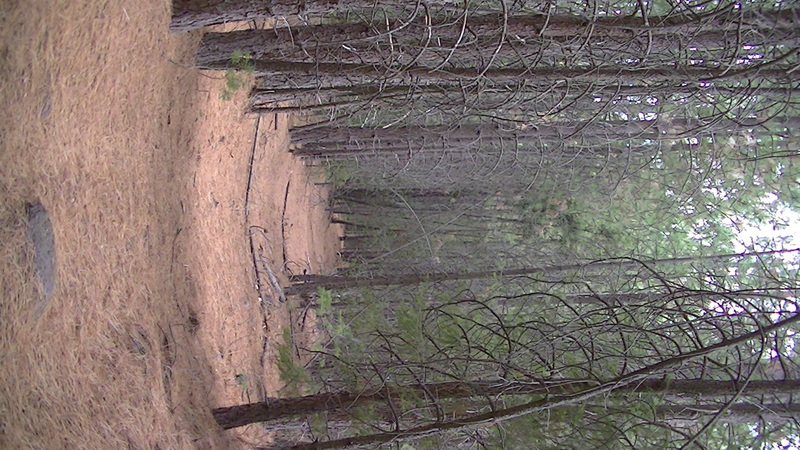 The old fire trail resumes to the left. A hundred yards I hit the current, well maintained road coming up from Calpine controlled leases. In front of me are two side by side cyclone fenced compounds for the ATT and Mediacom antennas, suggesting segregated playgrounds for machines. The mountain top is surrounded by tall trees obscuring what would be a fantastic view. A narrow wedge next to the ATT erection gives the sole aerial view of planet Earth below. I hear voices but no one appears. A sign. I commune with the sacrament I thought to bring. After taking some pictures I pick up a rock for a souvenir, slightly reducing the mountain’s sky reach. I start my decent, a refreshed pilgrim. Nature, exertion, and Rasputin have shown me the way. But the way is unsteady going down hill on loose rocks and pine needles. I weave my way down the mountain, carrying on a friendly argument with gravity. I emerge off the mountain bearing not the word of God on tablets but four dead martyrs for Jesus. The entrance gate nears. Two young men in a new truck and cargo trailer await. Are they Roman oppressors attempting to enforce some Philistine private property edict on me? No, they are contractor seekers for ATT looking for the one true way up to service the cell phone towers. I assume my new role as the guru of Cobb mountain and address the bewildered. “No, this the old road for chariots of Mammon. It has been reclaimed by the Great Mother. You must take the Road of Bottle Rock and pass through the gates of Calpine.” They rejoice for having met one of wisdom coming down the trail. Thanks Dante for the well told tale.